If you are leaning toward Just In Time (JIT) Stock Control, check this feature out. You can easily auto create purchase orders directly from a job or list of jobs by right clicking and selecting Auto Create Purchase Orders. 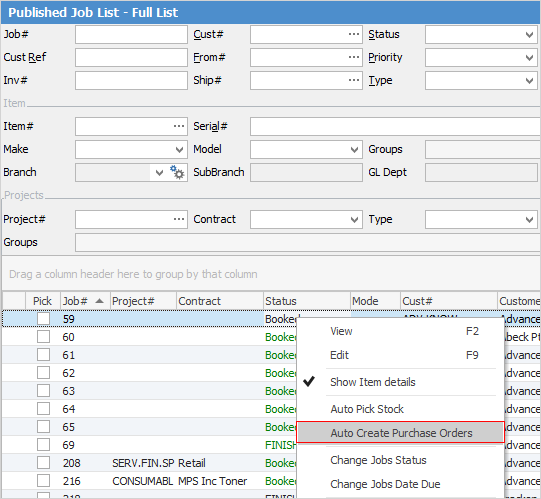 ▪Add the stock codes to your jobs up-front (the job information will update the purchase order). ▪Open a job or create a list of jobs using any of your list criteria, and Run the list. ▪Right click in the stock grid of a job, or anywhere within the job list result to open the Auto Create Purchase Order form. ▪Click Run to load the stock required from the job or job list. ▪Make any alterations to the selected stock. You are able to override the Order Qty column to bring in more stock, and/or change Vendor and so on. You can choose which products to order using the Order column (tick/un-tick the box at a line level or use Select All/Deselect All). ▪Select Order and you have just created purchase orders for exactly what you need. You can even edit the purchase orders themselves prior to sending them off to your vendors! Refer to Purchases and Expenses – How To Auto Create Purchase Order for full details.